Science Supplements Natural E contains a natural form of vitamin E and organic selenium. Vitamin E is a powerful antioxidant vitamin that cannot be made by the horse and must be obtained from the diet. Vitamin E plays a vital role in a horse's immune response, strengthening the body's natural defences against illness and infection. It is also essential for muscle & nerve function and for healthy skin and eyes. This supplement is perfect for horses in work and those on a low vitamin E diet. It is also great for older horses, breeding stock and horses that generally need muscle or immune support. 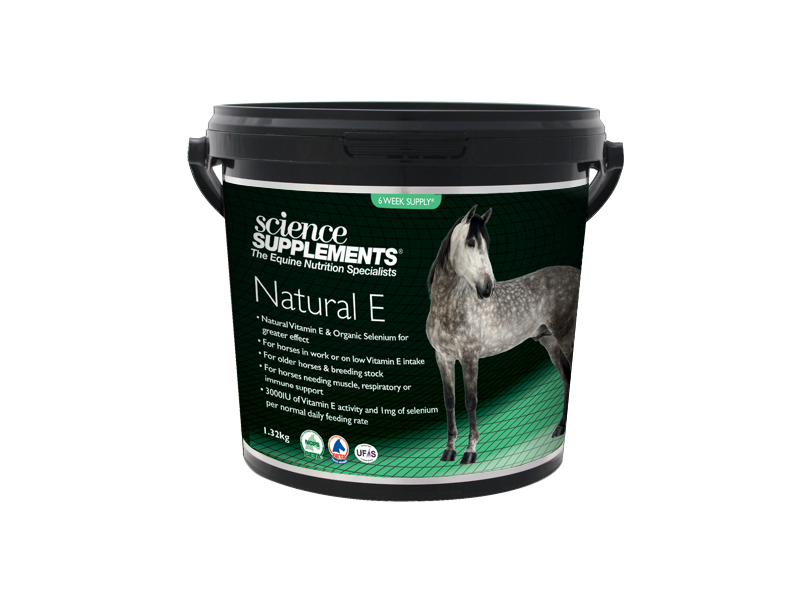 Natural E also contains organic selenium, which is essential for the optimal activity of Vitamin E.
This item is currently out of stock with our supplier. Please call 01344 283888 for more information. Natural E delivers 3000IU of Vitamin E and 1mg of Selenium per daily dose. Many other Vitamin E supplements use synthetic forms of Vitamin E, which may not be as biologically active as the natural form. The scoops can be divided between either one or two feeds per day. Do not exceed the recommended intake. The Vitamin E and Selenium intake from other dietary components should be considered. 1.32kg tub lasts 6 weeks, based on the maintenance feeding rate of 2 scoops daily for a horse. A daily dose (2 scoops for average horse) provides: Vitamin E 3000IU; 1mg Selenium; 5g L-Lysine; 2g DL-Methionine. Additives (per kg): Vitamin E (Natural) RRR alpha-tocopherol (3a700) 95.2 KIU/kg.